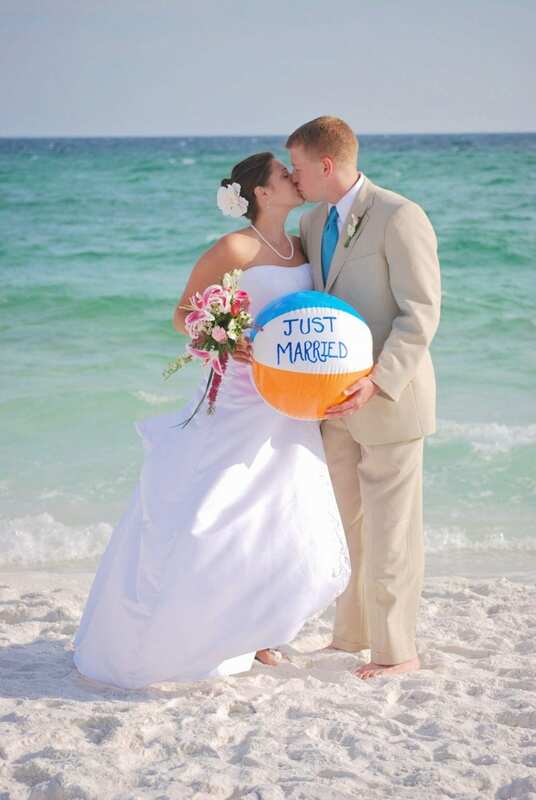 Pensacola Beach Weddings makes your beach wedding ceremony easy, and stress free. All you have to do is check out our packages page, and choose the package that fits your beach wedding decor. Reserve your date with a deposit, and then make all of your decor choices. We have over 20 different colors of material for the bamboo canopy. Over 20 different color of chair sashes, or you can choose our white deluxe wedding chairs for your guests’ comfort. We have nine different ceremony choices, and a ceremony music playlist, plus more. And, if you are incorporating children into your ceremony, the sand ceremony is a great way to bring a new family together. With our Distinctive Design custom design packages, Pensacola Beach Weddings can really showcase your wedding ceremony. With our decor for your beach wedding ceremony, and the beautiful Pensacola Beach as the backdrop, your photos will be a lasting reminder of the beauty of your wedding day.